Few figures are as important in a child's life as their father. Whether the man in your life is a new father or a grandpa to many, show them how much you appreciate and care for them with our gifts for fathers. 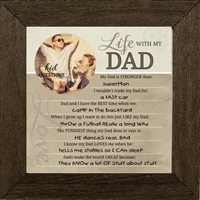 Some of our items are perfect as new father gifts, like a frame for an ultrasound picture. Mom won't mind sharing some attention at her shower if you give one of our daddy baby shower gifts. 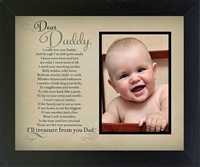 Surprise him with a frame or photo album that can be filled in with precious images of baby. 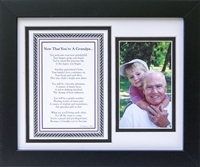 Our cards and framed poems for dad will resonate with both new and experienced fathers. 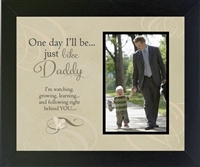 If you are looking for a gift for dad from baby, consider our popular Daddy's Little Girl or Boy Handprint Frame, which comes complete with a stamp pad and easy instructions. Dad has enough ties and strings of soap on a rope to last a lifetime so this year, choose a personalized gift for a father that he will cherish forever.